AT least 27 people were killed and about 155 injured during a rock concert that featured fireworks late on Friday in a Bucharest night club. In one of the capital’s worst disasters in decades, about 400 people, mostly young adults, stampeded for the exit as the club in the basement of a Communist-era factory filled with smoke. Several witnesses said there were fireworks inside the club. A pillar and the club’s ceiling went up in flames and then there was an explosion and heavy smoke,a witnesses said. TV footage showed police officers and paramedics trying to resuscitate young people lying on the pavement while sirens wailed with more ambulances deployed to the scene. 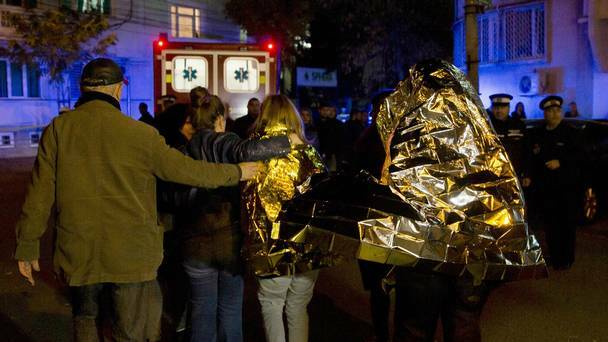 The victims were admitted to 10 hospitals in Bucharest, said Deputy Interior Minister Raed Arafat. Deputy Prime Minister Gabriel Oprea said an investigation into the causes of the incident was already under way, and the health minister launched a public appeal for blood donations.